Today I am happy to have Susan as a guest blogger. She is a fairly new blogger and has a bunch of great ideas since she has taught in a wide ranges of areas. I won't give it away, but she blew me away with a little INB tip that she shares in this post. Enjoy! Hello Fifth in the Middle Friends! I'm Susan from Passion in Portable Land! I would like to start off by thanking Diane for allowing me the opportunity to reach out and hopefully connect with more people through her blog. Diane, you are amazing and a true blogging inspiration to those of us who are just starting out! THANK YOU!!! I recently joined the world of blogging on 1/20/14, but I've been teaching since 1994! Gosh, that's almost 20 years! I've taught every grade level from Kindergarten all the way up to Seniors in High School! If you really want to know more you can read all about me and my family here! I was introduced to the world of blogging last year by Joanne from Head Over Heels for Teaching! For those of you who know her blog I'm sure you would agree that Joanne is extremely motivating and inspiring! Am I right? I started blogging because I love sharing ideas and collaborating with fellow teachers. I only have 30 followers and would like to spread my wings and meet new people! I can't even imagine having over 1900 followers like Diane! I'm a long way from that. My most popular post was: Five for Friday-Because I'm Happy Link up! I revealed my new blog design during that link up party. I just LOVE LINKY PARTIES!! Don't you? Well, I think it is time to start one of my own and you know what people say...There's no time like the present! Ladies and Gentlemen I give The Weekly Interactive Notebook Linky Party Button! That's Right! 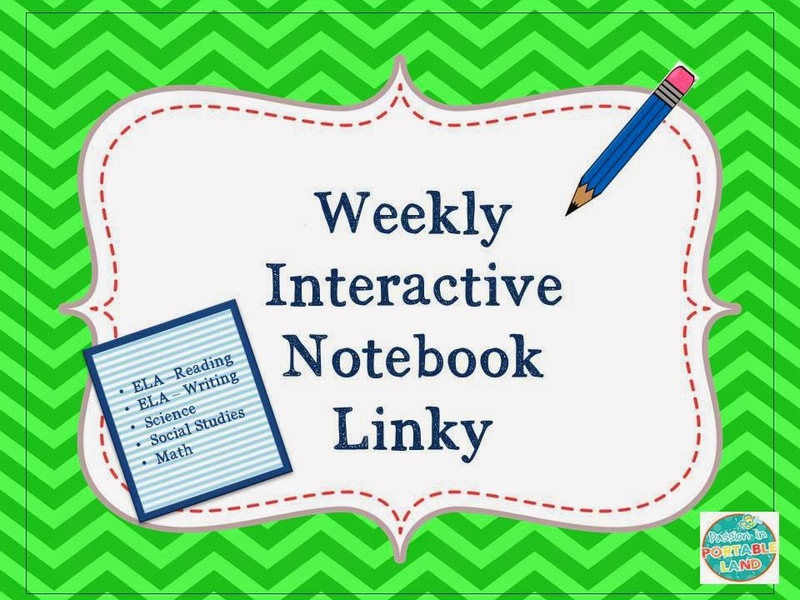 I'm starting my own Linky Party for Interactive Notebooks! I love them and want to share my ideas with you. I also want to learn more ideas from others. I know many of you have experience using Interactive Notebooks and have super fabulous ideas that you are just dying to share with me, Right? Well, I hope you are because I am ready to learn from YOU!! To start this party off let's start by sharing what we use for Interactive Notebooks. Do you use Composition Notebooks, Spiral Notebooks, 3-Prong Folders, or 3-Ring Binders? "Do you prefer spirals or comp books for ISN's?" Well, I prefer spirals because there is less cutting involved! Many prefer comps because spirals can become twisted, and catch on everything. I have the perfect solution! DUCT TAPE!! Yep! See pictures below! My students loved adding duct tape to their notebooks! You can read more about this here. Grab a cup of coffee, OJ, Wine, or what ever you are drinking these days and head on over to my blog, Passion In Portable Land, and link up to Week #1 Interactive Notebook Linky Party! I hope you link up! We use composition notebooks for reflection journals, and spiral notebooks for writing journals.Your linky party sounds like a great way to share some ideas on this. I just did a workshop in our district on notebooking and am always looking for ways to improve our reflections through notebooks.